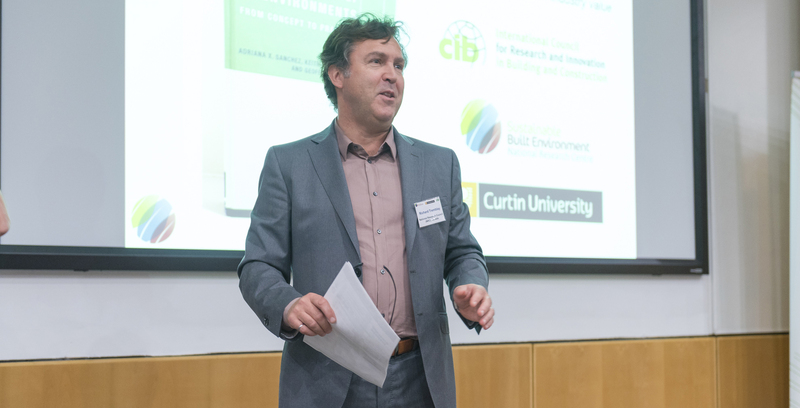 Last month Western Australia hosted the International Board and 20 members of the International Council for Research and Innovation in Building and Construction (CIB). This was the first time this prestigious organisation held its Board meeting in Perth. The Board held two days of meetings, aligning global research strategies and discussing international working commission and task group progress. The formalities were highlighted with a joint CIB Board and SBEnrc Board senior networking dinner at Curtin University, St George’s Terrace, Perth on Tuesday 14 November, when the international guests were joined by leading Australian industry and government leaders. The group was welcomed to Western Australia and Curtin University by Curtin University’s Vice-Chancellor, Professor Deborah Terry AO and WA Minister for Housing, Veterans Issues and Youth, Peter Tinley AM, MLA. There was a wonderful traditional welcome to country by the Moorditj Mob indigenous dancers from Wesley College led by Professor Simon Forrest, a Wadjuk Nyungar man and Curtin University’s Elder in Residence. On Wednesday 15 November, we were delighted to host the Collaborating for Industry Solutions in the Built Environment (CISBE) International Symposium. Delegates were entertained and informed by Kourosh Kayvani, Managing Director – Design, Innovation & Eminence at Aurecon who spoke on Reimagining Academic-Industry Collaboration and American Curtis Rodgers, Principal Vice President, Brick and Mortar Ventures, who spoke on How the Silicon Valley, US Military, NASA, and Industrial Mad Scientists are Disrupting the Construction Industry. Each of these and other CISBE presentations are available for viewing and downloading from the SBEnrc website. Also at the international symposium, SBEnrc’s BIM Value Benchmarking was launched by Richard Choy, CEO, NATSPEC Construction Information and Martin Lodge, General Manager – Strategic Projects, Western Australia Department of Finance. BIM Value Benchmarking is a free online tool for comparing a constructed project with data collected from BIM and non-BIM projects, making it possible to benchmark benefits delivered by building information modelling. SBEnrc’s BIM Value Tool and BIM Value Benchmarking are complementary tools now hosted on our industry partner NATSPEC’s site – BIM Value assists at the beginning of a project to identify which metric and enablers of BIM have the most potential value; BIM Value Benchmarking can help assess actual value when the project has been completed. Over time, BIM Value Benchmarking will provide comparative feedback to help refine decision making regarding BIM implementation. This day was also marked by a global first with Curtin University’s CIB Student Chapter hosting 30 students from other international CIB Student Chapters. This provided students with the opportunity to build important research and personal networks, for the benefit of future built environment research. Our visitors were also treated to a technical tour of Curtin University’s research facilities, including a ride around campus on the driverless bus, KIP, and a visit to the CBS Trading Room, a distinctive learning space simulating a real-life business environment to prepare business and finance students with the practical skills needed to graduate career-ready. Our next National Industry Research Workshop series is scheduled for the week of 12 February 2018, with workshops eliciting industry ideas for future research in Brisbane, Sydney, Melbourne and Perth. This regular national process ensures a constant refresh of the SBEnrc industry research agenda, and makes sure the newly funded projects to commence in October 2018 reflect current industry research challenges. Overall it has been a very satisfying year, with the completion of seven projects in early 2017, and the commencement of the new projects, and our preparation for developing new industry inspired projects in early 2018.SBEnrc Board Chair John V McCarthy AO and I would like to wish you a very safe and joyous holiday season. We look forward to working with you again throughout 2018.We would like to take this opportunity to thank our core members for their on-going support. Please note we will be closing for the Christmas break from Friday 15 December and reopening on Wednesday 10 January 2018.